Before you buy this kit, PLEASE read this page COMPLETELY ! The items you will get, are on the Bill of Materials. There is also a section of Required Parts, NOT Included. Those you will NOT get, and must get on your own, separately ! Thank you for your purchase of this nixie clock kit. Available on eBay, with most requisite parts, less the tubes, along with the PCB. 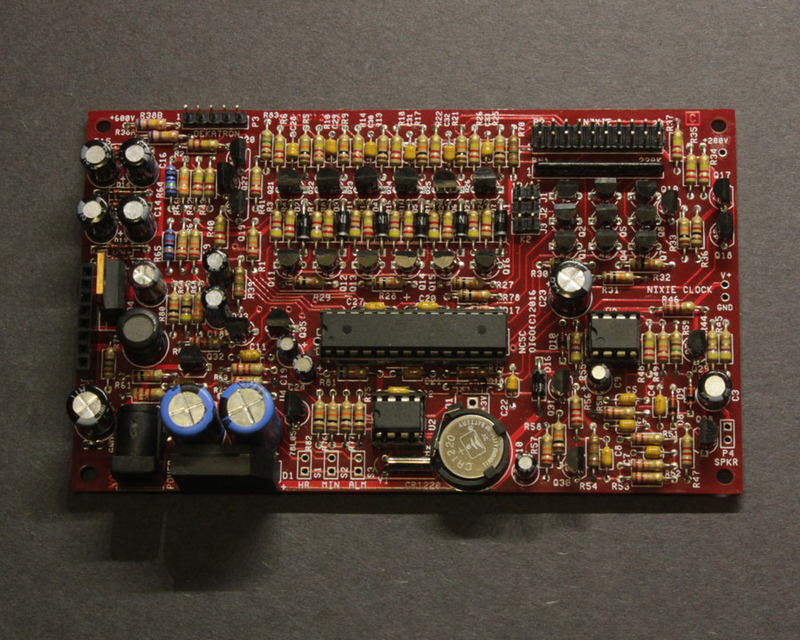 The design is based around an AVR Mega88 microcontroller. It can drive 6 nixie tubes, and an optional dekatron. It has an on-board HV supply, but also has a connector location, for an external unit. 9VAC or 12VDC, at 1 amp, can be used to power the unit. It will automatically detect if the line frequency is 50Hz, 60Hz, or DC. If AC, it will use it as the timebase. If DC, it will use the on-board 32.768KHz crystal. Current draw is dependent on the type of nixies used. Make sure the rectified and filtered DC voltage does not drop below 7.5V, or higher than 15V. I used a 9VAC 1Amp adapter will be fine for this kit, as it draws less power than my descrete logic clock kit, at Jameco. Update May 15, 2016: Kits shipped after this date will use the Revision C boards, and parts. This revision was mostly a clean-up. Older Revision B, used Revision A boards, with several parts different from the silkscreen. Revision C fixes the silkscreen. There is one actual electrical change. C1, which was a 2200uf cap, has been split to 2 1000uf caps. It, however, works the same, and ALL revisions use the same firmware. Discovery February 10, 2016: On a return for repair of two boards, that exhibited severe ghosting. It was discovered that flux residue conducted enough current to turn ON transistors, erroneously. Solution: Clean your boards, when you’re done soldering ! I personally prefer acetone and a toothbrush. 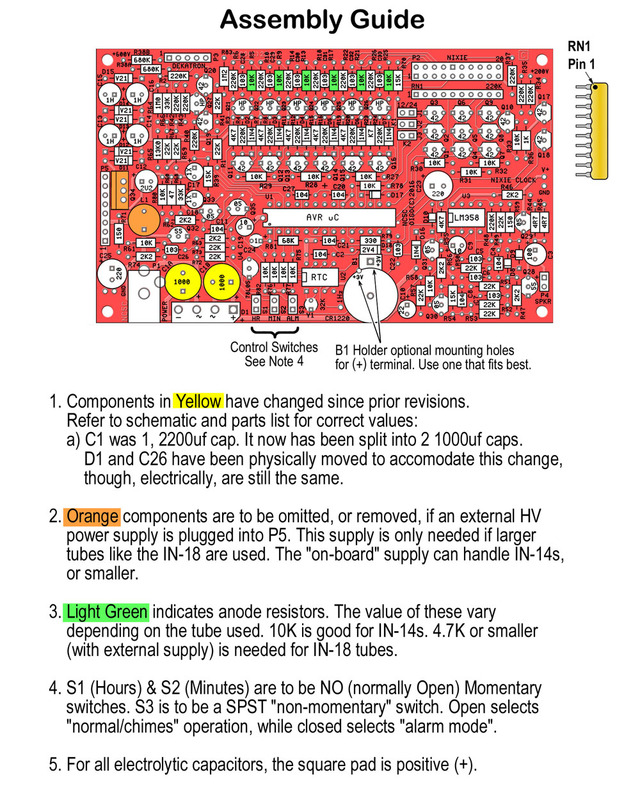 Update June 9, 2015: Kits shipped after this date have some component value changes. These will be designated as Revision B. The board, itself, remains the revision A board. Changes are the anode resistors shipped (was 6.8K, now 10K), also the gain of the chime amp has been increased, by changing R48 from 68K to 220K. 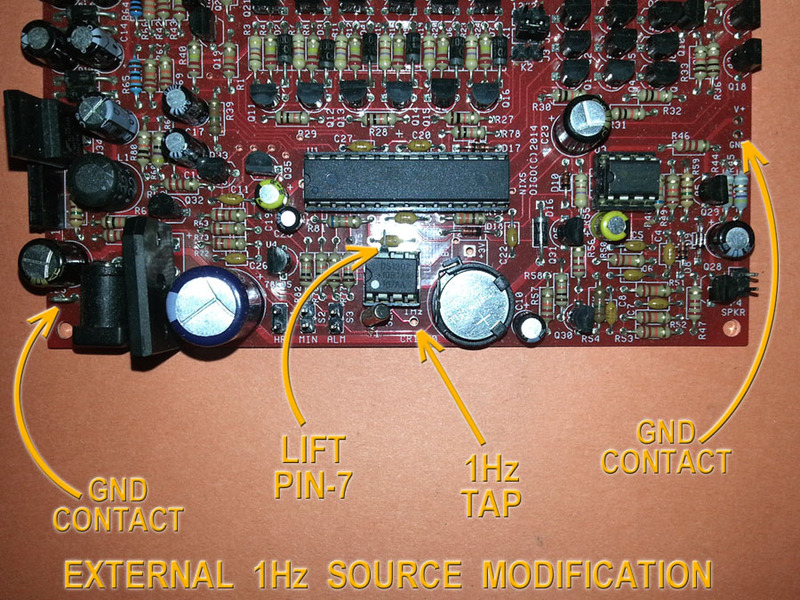 Discovery May 10, 2015: On a return for repair board I discovered a flickering issue. I repeated it with another in-house board. It appears that some flickering ghosting occurs with anode resistors of 6.8K of smaller, while using the ON-BOARD HV power supply. It can be remedied by either using higher value resistors, 10K, or higher, or using an external supply, like the NK01A, or NK01B, with the lower value resistors. Notice: Revision A Board released March 10, 2015. This board’s primary change is the addition of 6 0.01uf caps, to the anode driver section (C28-C33), to inhibit ghosting, with higher gain transistors. The original board has the number NC5. The new Revision A board is numbered NC5A. Note: nixie tubes, dekatron, and most connectors not sold with kit. If this circuit “bites” you, usually its does little, or no harm. However, some care must be taken to avoid getting shocked by this circuit, especially for those with heart conditions. Avoid touching any of the traces when the circuit is ON. That said, its much safer than other circuits powered directly from the high voltage AC lines. This circuit is based around an AVR ATmega88 microcontroller. It has been designed to use parts that readily available. The nixies are driven in a “multiplexed” fashion, to simplify both hookup, and the keep parts count down . Its a unique form of multiplexing, known as “Charlie-plexing“, after an engineer, at Maxim, Charles Allen, who came up with the scheme. But he did it with LEDs. Jason Harper, saw that the BE junction of a transistor, is just another diode. This scheme will work with transistors. With a minimum of IO lines, that can do double duty, of both switching the emitter, and base terminals of HV transistors (MPSA42 or 2N6517). There are a couple of limitations with charlieplexing: (1) Only one element can be ON at any one time, and (2), all the current, that goes thru the driven element (LED, nixie, …) must go thru the driving device (uC). This would be a problem if the display was a 7-segment LED, needing multiple segments ON at any one time, and often seeing peak currents in excess of 100mA. Fortunately, we are running nixies, where we desire to only have one numeral ON, and the peak currents are relatively low. In short, for nixies, these are non-issues. 4 IO lines are all that are needed to select one-of-10 nixie cathodes, while 3 IO lines can select one-of-six nixie anodes. 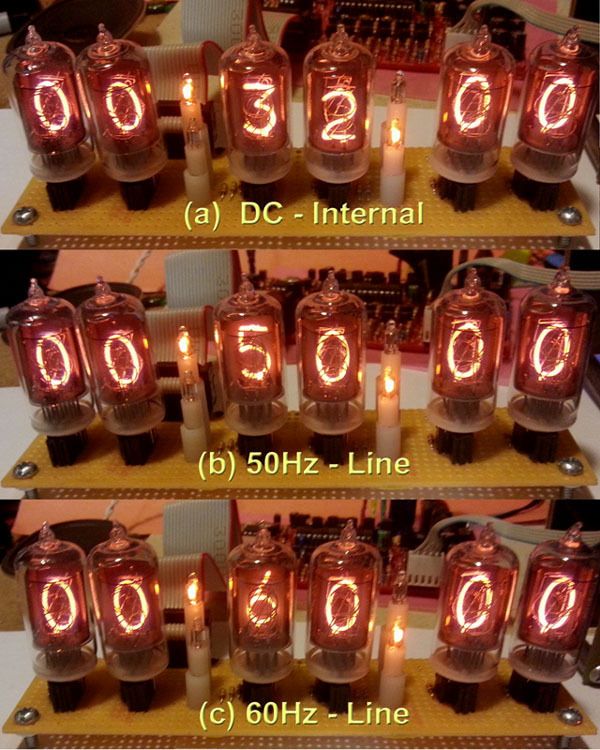 The corresponding cathodes of all six nixie tubes are tied together, so turning ON one anode, and one cathode, turns ON only one numeral of one tube, at any one time. Doing this at a 64Hz frame rate, dwelling at one tube (as controlled by turning ON its anode) for only ~2mS, makes the human eye see all the tubes ON. This is the essence of multiplexing. It does sacrifice brightness, to achieve this simplicity. Though it should be bright enough for a normally lit room, in most households. Emphasis on “Mid-Pull” Resistors ! You will notice that there are 220K resistors (both individually, and one network [RN1], containing 9 resistors), that are connected to every anode and cathode signal, on P2. The other side of these resistors are all tied to 100V. These are mid-pull resistors. Their primary function is divert leakage current away from the nixie tubes, and inhibit any chance of “ghosting”. They are nominally tied to a middle voltage, so that all the OFF anodes, and cathodes go to 100V. But, in fact, this connection can be left open. The main point, is that there is an additional conduction path across each anode to cathode. One that still conducts below the ionization levels of neon. Another anti-ghosting step, is inter-digit “blanking”, where there is a time gap, when NO digits are ON. This is done in firmware, by the uC, and is 250uS. Note, nixies respond in the ballpark of 50uS. Note, I did find a new source of Ghosting, but it should not be an issue with the parts shipped with these kits. I already have a solution,for future revisions, of the board. 1) Automatic timebase selection. The clock measures the incoming low voltage powering it. It will measure the frequency. From that it will decide that its 50Hz, 60Hz, or DC. If DC, the clock will use its 32KHz crystal. Note, in most developed countries, the AC frequency is a much more accurate timebase, than the crystal. 2) An RTC, or “real time clock”, with battery backup. On this board, is a small chip, that’s powered by a small CR1220 3V lithium coin cell. This RTC will maintain the correct time while the clock is off. The coin cell is only used while the clock is off. 3) Dekatron Pendulum. Two patterns can be user selected by a shorting jumper. 4) 12 or 24 hour display modes. Again determined by jumper selection. 5) Hourly chimes. 2 modes; long, and short. The short version only chimes the number of hours, at the hour mark. The long version, plays “Westminster Quarters” at every quarter hour, with the number of hours following the hour “quarter” preamble of 16 notes. The notes are simple divisions, and not musically exact, so it may sound unpleasant to those with better tuned ears than I. 6) Alarm clock mode. When in this mode, the chimes are disabled. A five minute train of gongs will sound, when the “alarm time” is reached. It can also be stopped by flipping the switch out of alarm mode. 7) On Board HV power supply, for powering smaller nixie tubes, from the IN-14, and smaller. 8) Crossfading digits. The display softly transitions from when the digits flip. The clock has only 3 user controls. An hour “button”, a minute “button”, and a alarm “switch”. Pushing the hour button, initially makes the hour jump backwards. Additional depressions, will make the hour advance. This is a convenience, for Daylight Saving Time. It also make the clock temporarily go into 24-hour mode. The minute button, advances the minute, and also transiently puts the clock into 24-hour mode. The clock will drop back to its jumpered setting after 7 seconds. The “Alarm” switch, will determine if the clock is in “alarm” or “normal” mode. When first switched to alarm mode, the current “alarm time” will be displayed. While it is displayed, the user can adjust this time with the hour and minutes buttons. The user has 7 seconds to push a button, to alter this alarm time. If a button is pressed, that time will be extended for another 7 seconds. The alarm minutes are only selectable to the nearest 5 minutes. This time will be displayed only in 24hour format, indifferent to the current 12/24 jumper setting. After the time out, the time revert to the normal real time, even though the clock is in the alarm mode. Any further pressing of the hour and minute buttons, while the real time is displayed, will alter the real time. In short, whatever time is shown, will be the one that’s changed. If it times out, just flip the switch back out of alarm mode, then back again into it, for the alarm time to reappear, and give you the opportunity to change it. Again, when in alarm mode, the chimes will be disabled, and sound will only be emitted when the real time hits the alarm time, and for at most, 5 minutes, thereafter. Rev A: 6 0.01uf axial lead ceramic capacitors, have been added, to make the total of these devices, per board, total 11. Rev B: Anode resistor R5, R9, R13, R17, R21, & R25 values are now shipped as 10K (6.8K in prior versions). This value will work for smaller nixie tubes, like the ZM1000, and can use the on board HV supply. For higher currents (lower value resistors), an external HV power supply is recommended. Also, R48 has been increased from 68K to 220K. The 0.01uf caps, shipped with prior kits, are mis-marked 6800pf caps. This variance is acceptable in most places. Though it did not attenuate the signal as much in the chime amp. The change in R48 compensates, when proper 0.01uf caps are used. Rev C: Silkscreen has been updated to match Rev B value changes. C1 has been replaced from one 2200uf cap to 2 1000 caps (C1A & C1B). For low voltage NPN transistors (Q29-31, 33, & 35), MPSA05, and PN2222 are listed, but 2N4401 are also acceptable, as are others not listed, as long as the hfe is at least 100, and can handle at least 500mA. Likewise, for the low voltage PNP (Q28 & 32). They are listed as MPSA55, and PN2907, but a 2N4403 is fine. If you find transistors not listed on the BOM, please consult the acceptable substitution guide by clicking here. The Microcontroller, U1, comes pre-programmed with the kit. Its also has its anti-copying fuses set. Any attempt to read it will show it as erased. Depending on the device programmer used, the attempt may also erase it. It should be assumed, but I won’t, that you need to stick the right parts in the right place, and in the right orientation. A few parts like the individual resistors and the ceramic capacitors have no orientation, so those only need to be inserted in their proper location. The resistor network, does have a proper orientation. Pin 1 is the common point of all 9 resistors buried inside of it. Make sure to stick the transistors in their proper locations. There are 4 different types that all the share the same TO-92 shape. Low V PNP, low V NPN, HV PNP, and HV NPN. The low voltage parts have higher gain, and better saturation characteristics, else I’d use just two types. Don’t mix the diodes either. The 2.4V zener (2V4 a common way of using the “V” to indicate to decimal location) looks the same as the 1N914 (actually 1N4148) small signal diodes. Also 1N914s /1N4148s switch very fast (4nS). A 1N4007 is NOT a UF4007 ! Do not confuse the two, and forget whatever you read at audiophile sites about these devices. 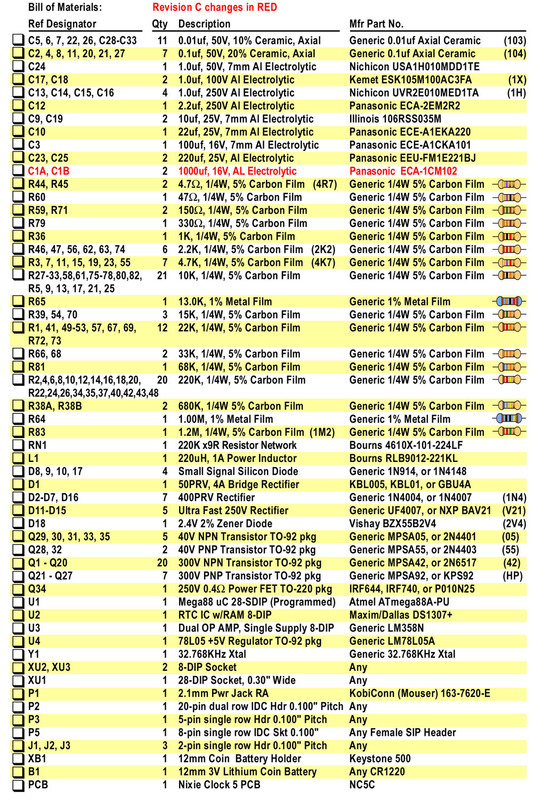 If anything, get the manufacturer datasheets and read those. The Internet is a great resource for research, if used properly, but unfortunately, a big conduit for the tinfoil hat crowd, too. 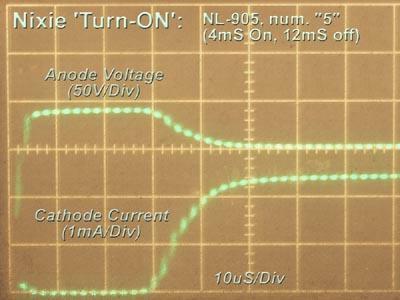 A 1N4007 (note the “1N“) is a common silicon rectifier capable of passing upto 1 amp of current, and withstand a reverse potential of upto 1000V. But its slow. It has a reverse recovery speed of ~2 to 3uS. This is way too slow for switching supplies which have pulses of only 2uS long or even shorter. This means the 1N4007, is still conducting, when it needs to block the reverse current. So all the power is lost, and never gets to the load. A UF4007, on the other hand, is an Ultra Fast (recovery) rectifier. It was specifically designed to be used with switching supplies. It switches at 75nS (0.075uS), so most of the power gets to the load. It just has the misfortune of sharing the digits 4007. When numbering these parts, somebody had the bright idea, of using the same numbers. Probably to show the similarities. Unfortunately, it now creates a lot of confusion. They are NOT super 1N4007s, but a whole different part. And substituting a UF4007, for a 1N4007, can create its own problems. Treat them as two completely different parts. They, also unfortunately, share the same DO-41 shape. Wiring can be direct, or thru connectors. Connectors are strongly recommended. It simplifies debugging, and reduces the chance of wires working loose, due to excess motion. Most of the dekatrons, above, are divide-by-10 tubes. The GC12/4B and GS12D are, however, divide-by-12, tubes. These two divide-by-12 tubes may not work properly with this circuit ! Parts Not Included – Please Read ! S3 – SPST Switch- CW GF-124-0013, Jameco 2184384, Jameco 621472, or Philmore Slide Switches. This allows you to choose between 12 and 24 hour display modes. Between two chime modes: (1) Quarters – which plays the full Westminster Chimes at each quarter hour, or (2) Hours Only – which only chimes the number of hours, at the hour mark. I figured this is more important for people with more discerning ears than me. And two dekatron patterns: (1) Pie – which is a pie growing from a dot from seconds 0 thru 29, then shrinks back to a dot, from seconds 30 to 59. Or (2) Precessing – which is a conventional dekatron pendulum, but its turn-around point moves to roughly the current second position. Underneath the crystal, is a pad that connects to the 1Hz signal, that connects between the DS1307 and the uC. It connects to pin-7 of the RTC, which usually sources the 1Hz. It can be disconnected by lifting Pin-7. Unplug the DS1307. Bend up pin-7, and reinsert the chip, excluding pin-7. The external 1Hz source connects between that 1Hz pad, and a ground contact. It should be a TTL level signal. That is it should be greater than 2.4V, but less than 5V. Also, the power input should be +12VDC, so the uC won’t use the AC line, as the timebase. D103 and C101 rectify and filter 120VAC to 165VDC. Since that’s added on top of the +12V, the nixies power N+, will be closer to +175V. C101 is a 47uf cap, which is needed to reduce the ripple. The existing caps on the board, where scaled for high switcher frequencies. This linear supply operates at 60Hz, so the capacitance must be increased. The multplier ladder on the clock board, needs to see a HV pulse train to work. The switcher usually delivers a pulse train near 200Vpp. Its the total pulse excursion that gets added to each multiplier stage. 120VAC has a total pulse value of 330Vpp. If this gets added to the ladder, the results will deliver ~800V, and exceed the component ratings. Adding a simple rectifier, reduces this value to 165V, but it needs to be reduced to 0V, when the pulse is removed. A resistor can be added. but to work effectively, it needs to dump the charge quickly, and draw a rather high current. This resistor will need to be a power type, which will waste power and get hot. Here and active emitter follower pull down stage is added. This circuit, will only dump the charge when the pulse is removed, which keeps the circuit cool. Also, the resistor values of R38 and R38A, are cut in half, and R83 omitted. The circuit will detect any audio coming out of the speaker, and trip the relay, passing the line power. It also will keep the relay engaged for at least one second any small audio burst. In alarm mode, when the alarm goes off, the relay should stay engaged, and power whatever is plugged in, until the alarm is shut off. It will stay here for around three seconds before displaying the time. You call also improvise. First setup in an area with NO carpet, or rugs. Have access to earth ground. A metal water pipe is best, but a nearby appliance that has a metal body, which is plugged into the wall with a 3-prong (grounded) outlet is also good. That third grounded prong connects the metal body to ground. Any time you get up, or get back into your workstation chair, grab the metal of that grounded appliance. Keep the parts in the static protected bag and “rails”, and only remove them while your touching that grounded appliance. An anti-static wriststrap and workpad are strongly encouraged. Google Public Folder – Here is a folder that contains PCB artwork files. Look for the files ZM1000x6.ZIP and IN14x6.ZIP .